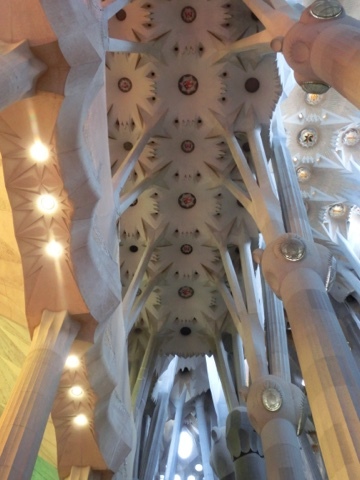 I just spent a week in Barcelona and Tarragona with my cousin and her son from the Uk. I loved Barcelona. The week zoomed by and now I wish I could have had another week. 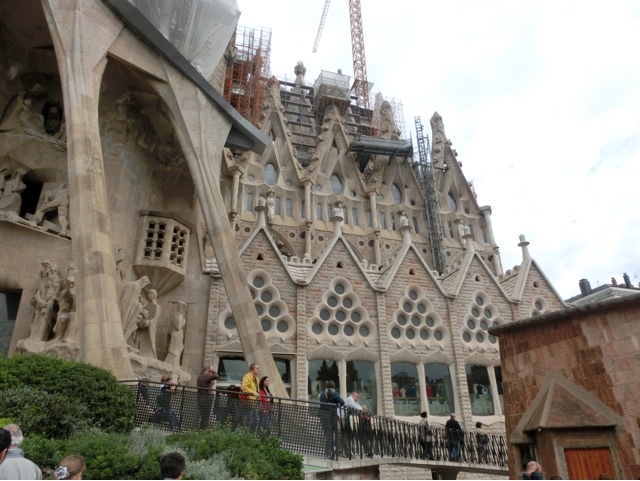 I followed the tourist trail and mainly visited Gaudi buildings such as the Sagrada Familia, Batllo house, & Palau Guell . 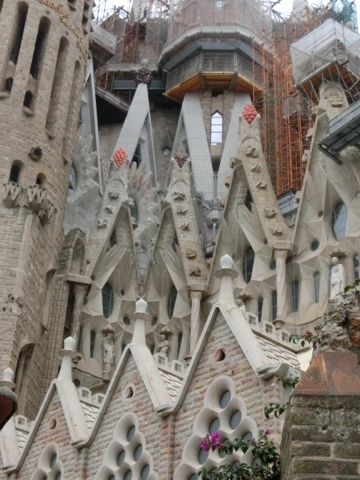 By going late in the day I didn't have to book in advance except for the Sagrada Familia. I look forward to seeing it completed one day if I live long enough, there is still an enormous steeple which isn't even started. 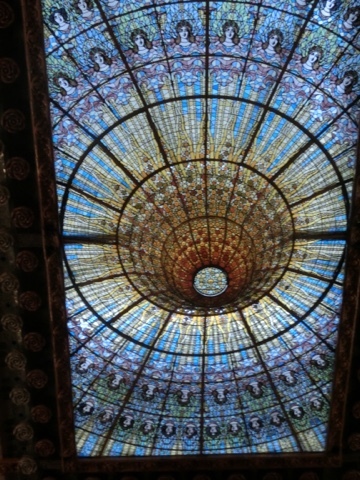 ceiling in Palau Guell. 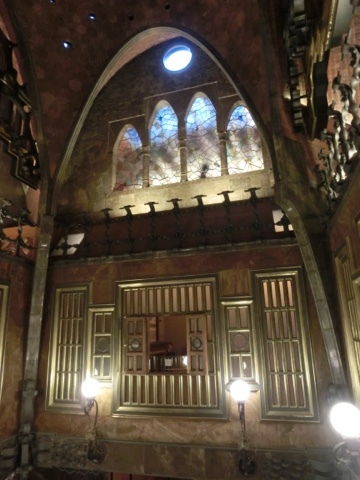 The Guells were patrons of Gaudi. 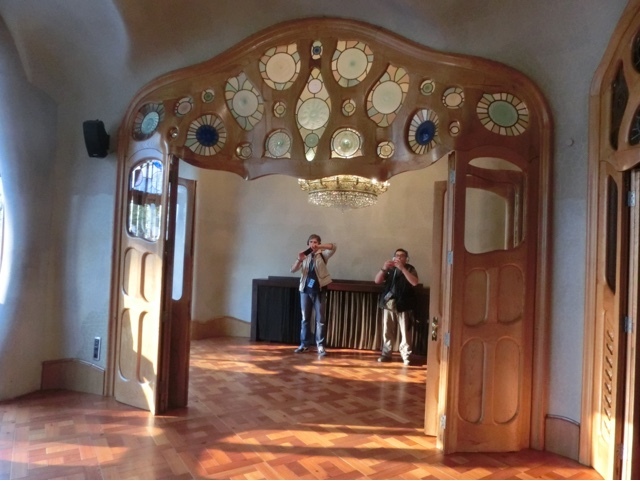 They spent mega bucks on the house but didn't live there long as Mrs Guell didn't like it. 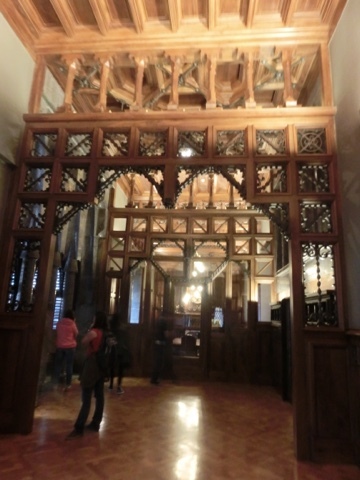 I can understand why, it's very dark compared with other places Gaudi designed. 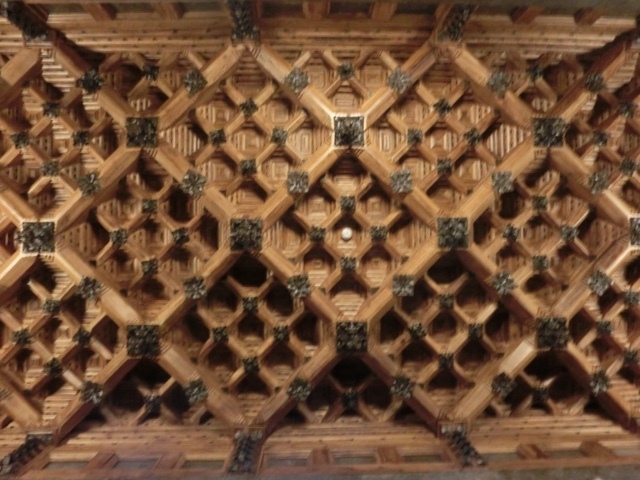 It was the start of his career and its full of wrought iron and dark wood. 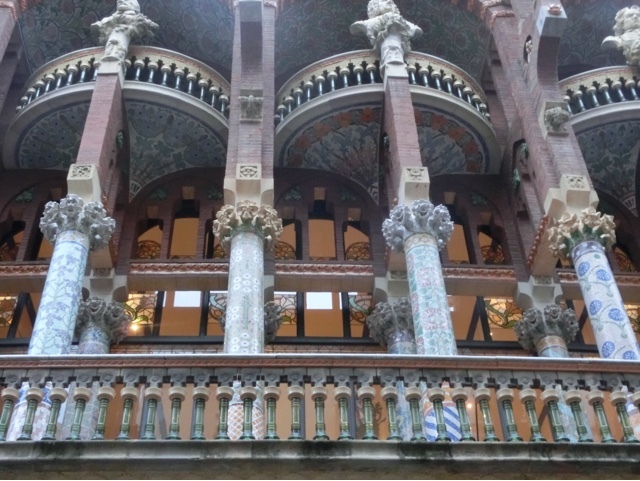 We also went to the musical theatre , Palau de la Musica catalana, which was designed by a architect Lluis Domenech I Montaner. I found it incredibly busy. 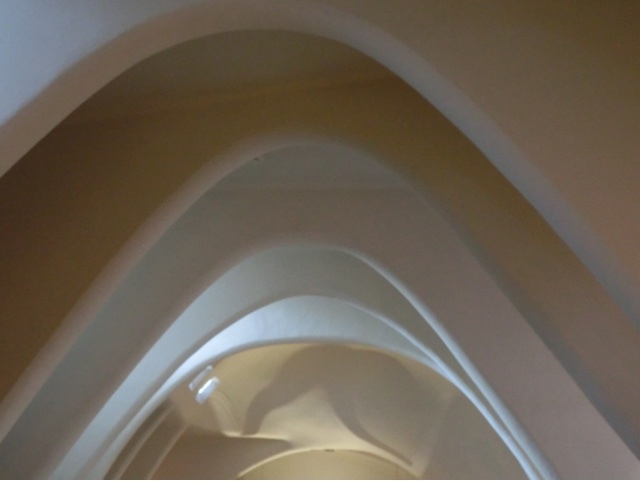 I prefer the simplicity of Casa Battlo. 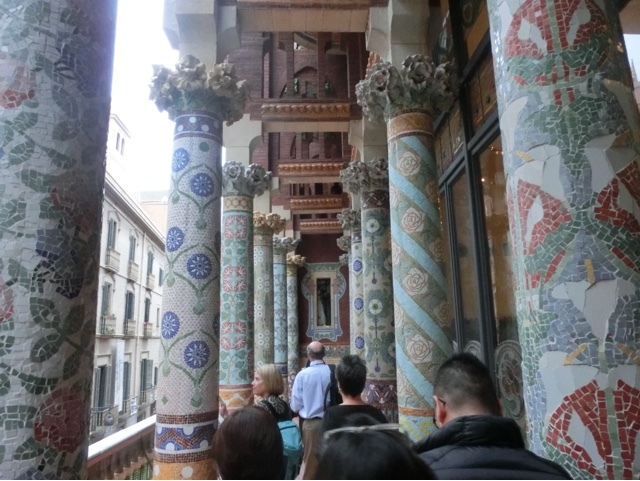 Mosaic pillars on the balcony. 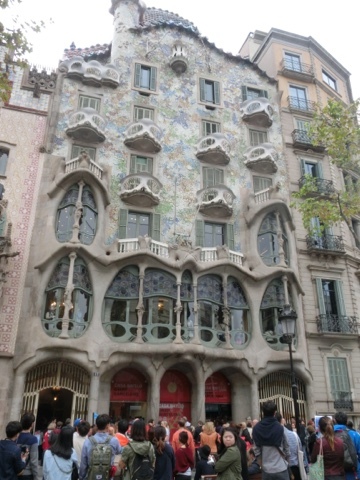 I found Barcelona exciting, easy to get around and it was great fun. I found the queues for the major attractions and having to book in advance annoying. I would definitely not try to do anything big at a weekend. I recall the glory days of the seventies when wandering was so much easier....because there were less of us doing it. And I wish I had done more!